By far, mood swings are one of the most common symptoms of menopause, plaguing women throughout their transitioning years. 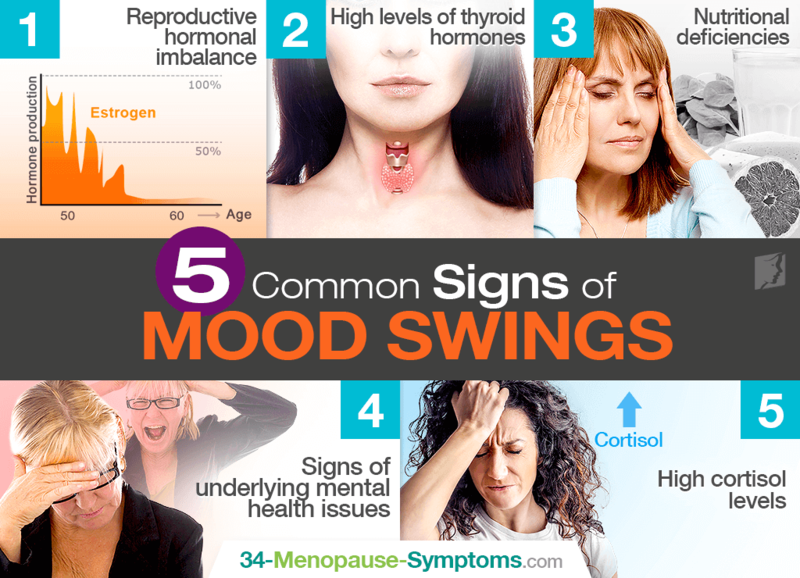 Although symptoms of mood swings are often self-explanatory, women may feel the need for more concrete information about signs they can use to diagnose the condition. Continue reading to learn more about the common signs of mood swings so that you can be more in-tune with your body. Reproductive hormones have a strong influence on women's moods, and research has shown that fluctuating estrogen levels cause women to be at a higher risk of developing mood disorders and depression. Consequently, supplementing estrogen in women who are passing through menopause or postmenopausal serves as a treatment regimen for mood disturbances. Also, overproduction of thyroid hormones - as is characteristic of hyperthyroidism - can cause women to suffer from mood swings, anxiety, and irritability. Hyperthyroidism can also lead to sleeping troubles, hair loss, weight fluctuations, and more, further aggravating poor mood. If you suspect thyroid disease, have a blood test performed to measure TSH, T3, and T4 hormones, or as seen necessary by your doctor. Without a doubt, the brain needs proper nourishment in order to function at its best. As such, a deficiency in necessary vitamins and minerals can trigger the occurrence of mood swings in women. Vitamins B12, D, and C in addition to the minerals magnesium and potassium are necessary for optimal mental health. Nutritional deficiencies can be resolved with a well-balanced diet or supplements, if necessary. Some menopausal women who are suffering from mood swings may show signs of other mental health disorders as well. For instance, episodes of extreme fluctuation from manic or depressive moods would signify bipolar disorder. Depression, on the other hand, is characterized by changes in mood with women leaning more towards extended periods of feeling down and lack of interest in common hobbies. Mental health issues should be properly evaluated and treated by a licensed specialist. Cortisol is a steroid hormone that serves many essential functions, most importantly controlling the body's response to stress. However, too much cortisol due to hypothalamic-pituitary-adrenal axis dysfunction or prolonged stress has been associated with a variety of severe mood changes, including depression, anxiety, and irritability. While cortisol levels can be reduced with stress-relief techniques, like meditation or breathing exercises, their more serious causes might have to be treated with conventional medicine. Women suffering from any of the aforementioned signs of mood swings should not feel hopeless as there are a variety of mood swings treatments available that work to treat the underlying cause, hormonal imbalance. Natural measures include the implementation of easy lifestyle changes in addition to alternative medicine for improved results. Keep in mind that you are not alone during these distressing times. With proper initiative and a will to find emotional stability, relief from mood swings is right around the corner.